4X4 PARTS WHOLESALE DIRECT TO YOU. Established in 1987 to supply the Auto trade with quality aftermarket four wheel drive parts at the lowest prices around. We import and distribute a large range of quality 4x4 parts to suit TOYOTA, NISSAN, SUZUKI, MITSUBISHI, MAZDA/FORD, DAIHATSU and ISUZU/HOLDEN, four wheel drives of Japanese origin. We source our parts from quality manufacturers and suppliers only. If we have problems with the quality of any part, we withdraw them from sale till we find better quality. From Just 4X4 Parts you can always be assured of getting the best quality available at very reasonable prices. You may find a cheaper price but rarely find better quality and service. A: They are dead on arrival. B: Are incorrectly described by us. 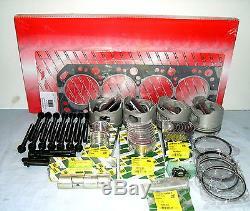 This Item: 1 New quality engine rebuild kit. To Suit: All Toyota 2.8 litre 3L diesel engines as fitted to Hilux, Hiace etc. 1 Engine overhaul gasket and seal kit. 1 set of 4 quality alfin steel insert pistons. 1 set of 4 gudgeon pins with clips. 1 set of 4 piston pin bushes. 1 set of piston rings. 1 set of main bearings. 1 set of conrod big end bearings. 1 set of crank thrust bearings. 1 Set of cam bearings. 1 Set of head bolts. Pistons and rings are usually available in the following sizes. Big end and main bearings are usually available in Std. We carry most sizes in stock but please allow a day or two if we have to get your size in. All parts are the best quality available and the same as used in reputable reco shops. THIS ITEM IS SENT POST FREE TO ANYWHERE WITHIN AUSTRALIA. Please send us a message if you require more info on this or other parts. Please check our other listings as we are continually adding more new parts. PLEASE NOTE: All parts are of aftermarket manufacture unless otherwise stated. We are unable to follow up or track parcels posted via this method. Whilst Standard Australia Post is generally very reliable, if you require your parts urgently please use our Express Post Option. Use this option for items which you need quickly. (This service is only available to customers within Australia). NOTE: Please remember to add your surname , or a brief item description to your deposit. The item "TOYOTA HILUX & HIACE 3L 2.8 LITRE DIESEL FULL ENGINE REBUILD KIT 1989-1998" is in sale since Wednesday, September 27, 2017. This item is in the category "Vehicle Parts & Accessories\Car & Truck Parts\Other". The seller is "just4x4parts" and is located in Surf Coast Vic.. This item can be shipped worldwide.